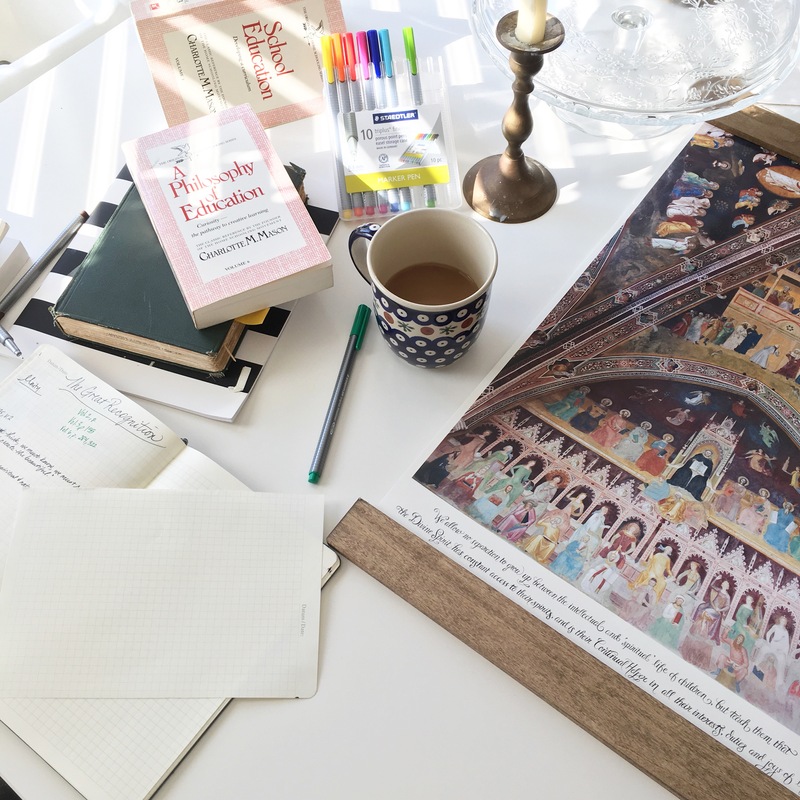 We’ve told you how much we love Riverbend Press before, and so we were thrilled when they offered to give us three beautiful prints to give away to in conjunction with our upcoming webinar on this painting. This print is really beautiful – printed on a product that is more like canvas than paper, it is durable and can hang unframed, as I do. It is a seamless combination of the upper vault and the wall of the Spanish chapel, which is a big deal! Imagine photographing from the middle of the ceiling nearly down the floor and having minimal distortion. It is an heirloom quality piece. How can you get one? Well, one way is to visit the shop. Another way is to win one right here! We have three to give away! One will be randomly drawn during our webinar and given to an attendee – so go register! Another will be given away to a commenter on this post. Leave a comment to enter, it is that easy. If you share this giveaway on Facebook, Instagram, or Pinterest – link it in the comments for an extra entry. The last print will be given away on our Instagram account. Giveaway will close Monday, March 20 at 8pm and all winners will be chosen and announced on March 21. In 2013, I was introduced to this painting at the CMI National Conference where Dr. Deani Van Pelt spoke on it. I think they allotted 2 hours for her talk, but no one in the room wanted to move as time ran out and we all could have chatted for many hours more. I spoke to my dear friends and told them that other moms needed to hear this story! At our 3-day summer intensive, I presented what I had learned and what I had found out since that day. Further study of the painting as well as further reading of Mason’s many references to it filled me with delight. Since that day, I have visited the painting twice and presented on it myself at the CMI National Conference last year. In my four years of studying this painting, I have still not nearly exhausted its many insights, but I will share with you the one I treasure most: Unity. Would you like to spend some time learning about who is depicted in this painting, the painter, the Florentines, and Charlotte’s writings on it? I’d love to have you join me for a webinar on March 21 at 8pm. It will be the presentation I gave last year, reworked to make some time for discussion and questions at the end. Grab a glass of wine and enjoy some mother culture. Our winners have been chosen! Our blog comment winner is Brittany, who chose the darker color and our Instagram winner is Amy who chose the same color! As soon as we get your addresses the books will be sent out. Thanks to everyone who entered! Also, if you are not the winner this time, we have some more special giveaways in the works with our good friends at Riverbend Press! We all need beauty. It is simply how we are made. Truth, beauty, and goodness give us a window into the Divine and so while it would seem to be enough for us to have a kitchen that is practical and uncluttered, it would never feel complete. We need to bring in something beautiful. What is beautiful? Surely, there is some aspect of beauty to a space that functions well. That lacks the excesses and allows the person using the room to enjoy its use. Then, the space should be clean. Cleanliness is next to Godliness they say. Take the time, if not this week, then perhaps during the Lenten season or the springtime to do a deep clean of your kitchen. You know the feeling when you are done – it is absolute joy. There is nothing like a sparkling sink and clean floors and an oven with nothing burnt on it to make one feel like cooking a delicious meal for others. So you have a space that is functional and clean, but what then should you add to it? The answer is as personal as the person and the family. I’ll give some ideas to spur your own creativity and then welcome your ideas as well. Favorite cookware: Is there a space to hang your dear cast iron pan, show off your wooden spoons, or somewhere to display those copper pots you love so much? If you reach for it often and love how it looks as well, why not bring it out for others to see? Favorite serving pieces: Perhaps you love to look at the platter from your wedding or your favorite Polish pottery rather than just storing them away. Put some pieces on the wall if you have the space and you can enjoy them for their beauty as well as their use. Quotes or inspiration: I personally love the quote I have over my sink from St. Teresa of Avila that says, “God walks amidst the pots and pans”. It reminds me that when I am doing simple tasks for the love of others, that is often exactly where God wants me most – especially if it is my least favorite chore. Maybe you could find something equally inspirational for you! A rug: Kitchen rugs are useful in spots where floors get chilly in winter or standing on tile can make legs weary. Don’t feel limited to the selection you find in the designated “Kitchen Rug” section at the big box stores. Sometimes a runner or area rug meant for another part of the house can have a beautiful pattern that brings a smile to your face each day. Curtains: Does the room need a bit of simplicity in the way of beautiful, white panels over the sink or perhaps your neutrals in the rest of the space can be livened up with some color and pattern framing the window? Upgrading just one thing: Is there a small appliance that is on the verge of dying or a utensil holder you just don’t like or some similar item that for you, is the opposite of beautiful? You don’t need to update the kitchen to love it, sometimes it is just replacing the one thing that really bothers you. It could be as simple as some beautiful new hooks, new knobs on the cabinets, or getting a new coffee maker. Donate the old thing if you can and bring some joy into your kitchen with a small upgrade. This is the time to really think about what brings you joy – what would make you smile each time you saw it? Add that! What is your favorite item in the kitchen? There are a few companies that just do things really well. I’m talking about the type of companies started by people who pour their heart and soul into it because they love what they do. Riverbend Press is that type of company. Begun by a homeschooling mother of two darling girls who also happened to be the daughter of an old fashioned book binder, she couldn’t find what she wanted when it came to high quality notebooks – so she stepped out and partnered with her dad to start a whole new company. Her creations are based on hours of poring over the Charlotte’s volumes, PR articles, and L’Umile Pianta articles to make sure her books were as authentic as they could be. She then had the books printed on the best paper with sewn bindings so they lay flat and finished them with beautiful gold-stamped covers. This is a company that cares about quality, produces their goods in the United States in a family-run business, and aims to offer the best service to all of the families who trust them with their patronage. We couldn’t be prouder to partner with them for our very first giveaway! 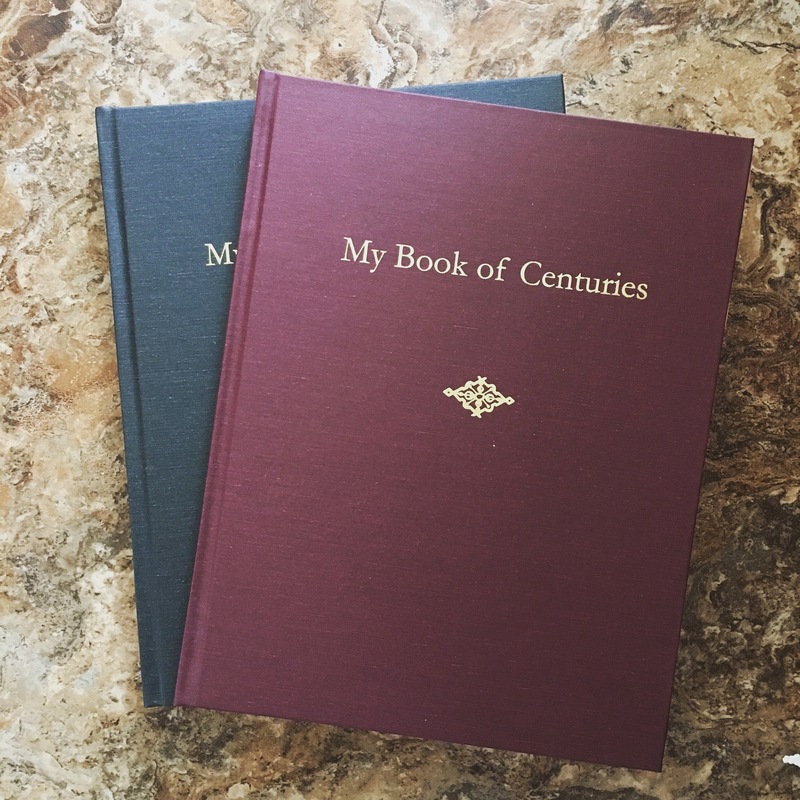 Today, we are announcing a giveaway of two Books of Centuries in your choice of grey or wine cover. We will give away one here on the blog and one over on Instagram, so head over there for another chance! The Rules: Leave a comment below stating the color you would prefer. If you share this post on social media (your blog, Twitter, Facebook, Pinterest, etc), leave a separate comment with a link leading to where you shared it and you can earn an extra entry! We will allow up to five entries per person. The comments will be closed at 8pm on March 2, 2017 and the winner will be chosen at random and announced here on March 3. Books can be shipped within the US only. February is not typically an easy month for schooling. I would say homeschooling, but I’ve heard from enough teachers that this is a universal struggle. I can’t help but think it goes beyond schooling at all. Winter is dragging on, there is little or no green growth, but we are so close. So close. 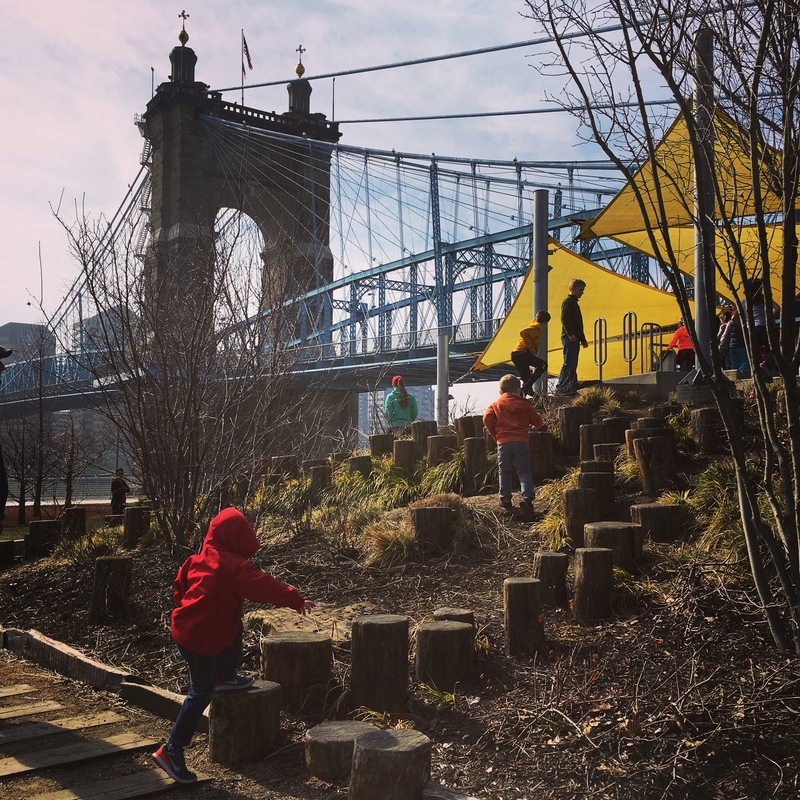 Spring officially comes in March, the days are growing longer, and hope is on the horizon for warm days, ice cream cones, and beach trips. How can we best manage our days through this very long shortest month of the year? One way I have found is to get outside more. We’ve been lucky this year in that the weather is mild. We went to the park today to get some sunshine and it was lovely. Because of that decision, not all the schoolwork will get done today and that’s ok. It isn’t ok every day, but here and there in February, it can make all the other days so much more bearable. Mother culture time. Moms need to recharge too. 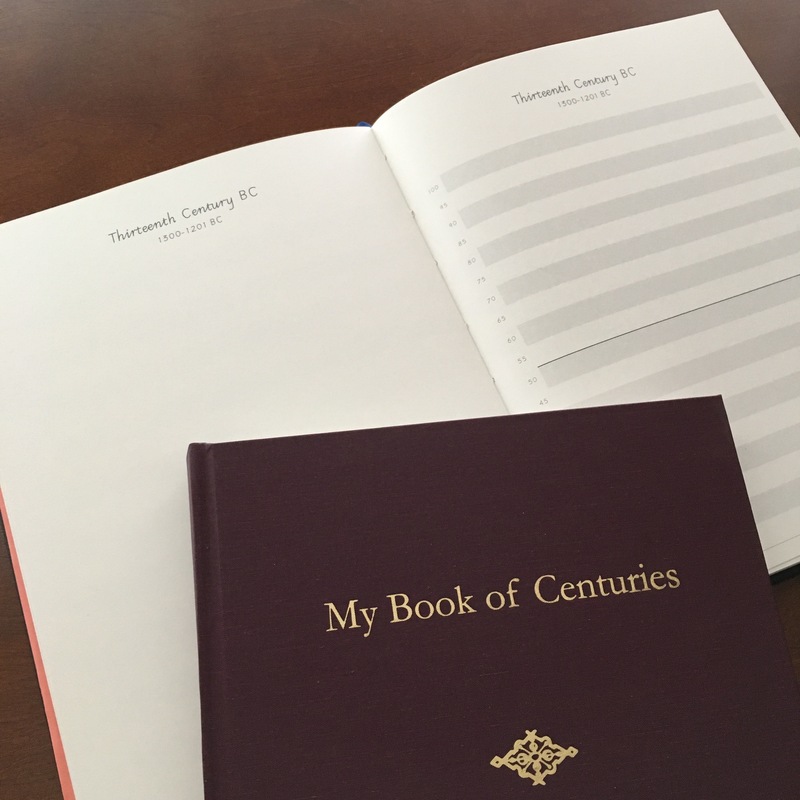 I have mother culture activities in progress the same way I have books in progress – easy, medium, and hard all ready for me to pick up wherever I left off whenever the time is available. I just finished an embroidery of a worker bee (part nature study, part handicraft) and I’ve been enjoying doing some hand lettering in the evenings. 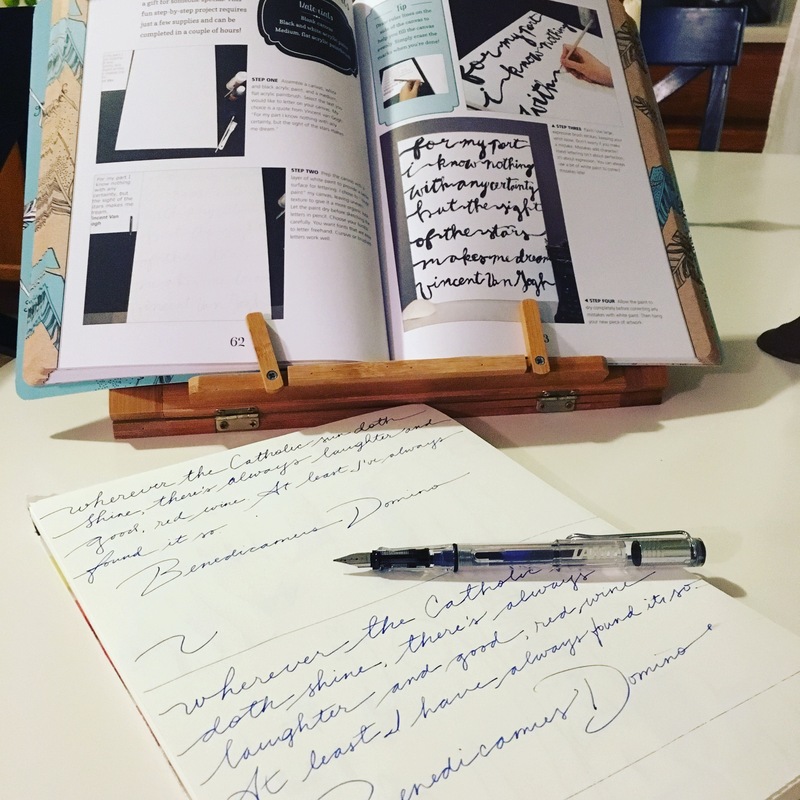 It is only enjoyable when I am surrounded by a clean kitchen and sitting at a clean table, so I am always sure to get those things done early when I remind myself I can have some time to enjoy writing later. Coffee. 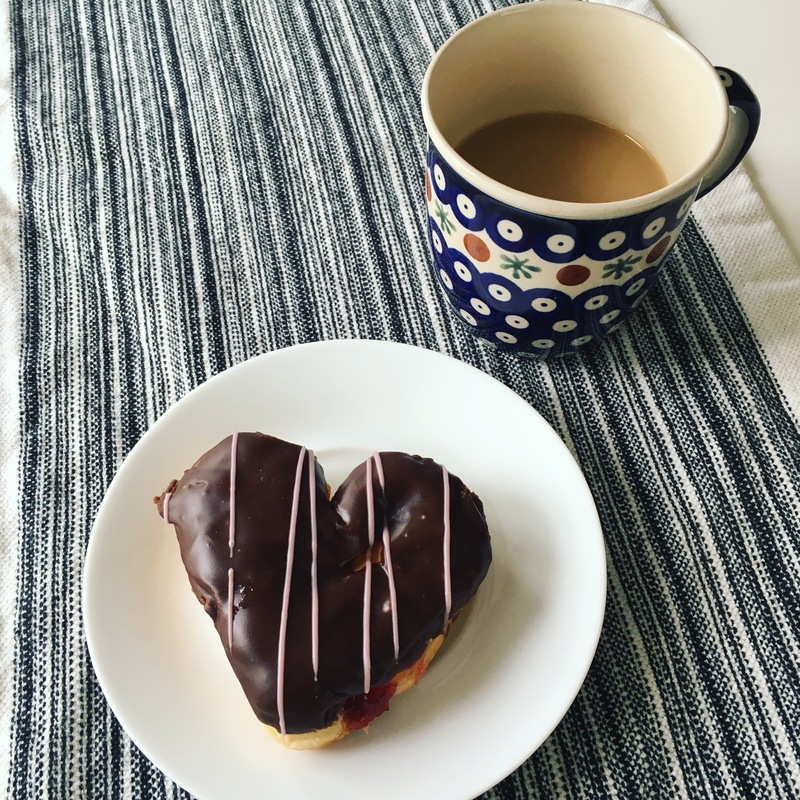 An occasional donut. Enough said. Field trips. I find February to be a great time for field trips. If the day is dreary or cabin fever is running high, have a list ready of places you’d like to go with the kids. If you are well prepared, you can take this time to see the term artist at the local art museum, go to a history museum that supplements your readings that term, or find hear your composer being played by a symphony. 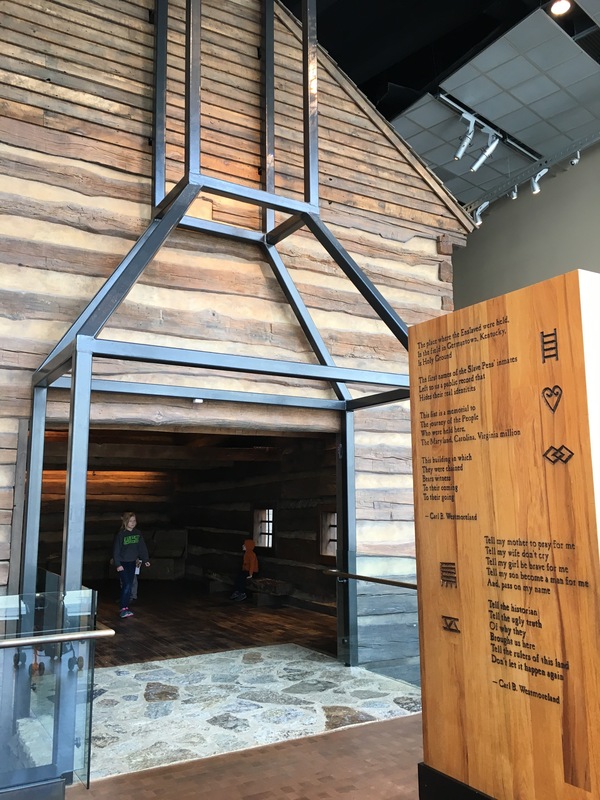 We found that we live right by the National Underground Railroad Museum and that seemed like a great way to supplement our study of Lincoln and Douglass and the Civil War. 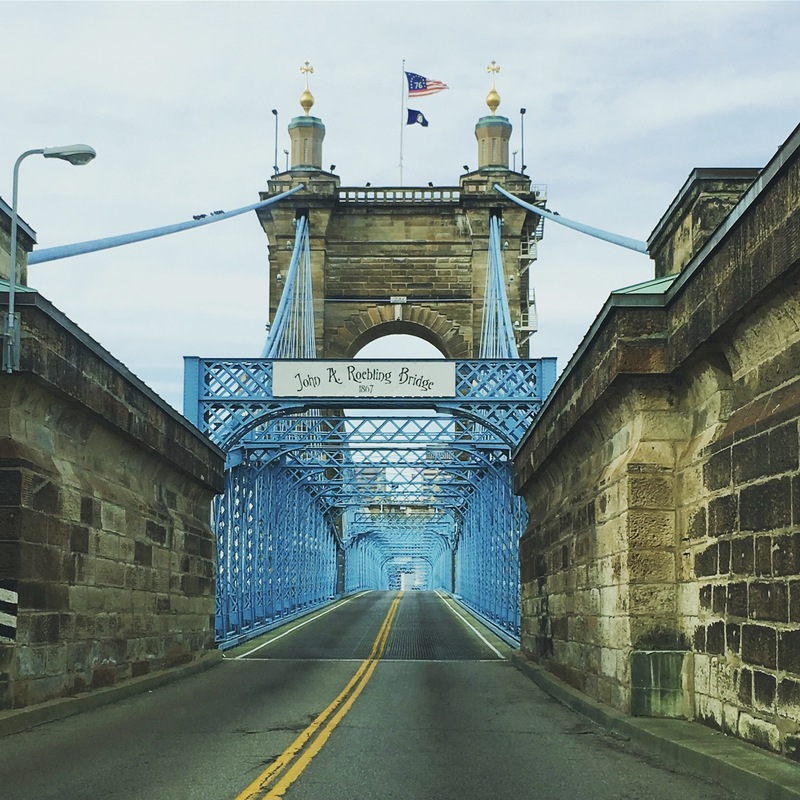 We were lucky enough to then come upon the John A. Roebling bridge that spans the Ohio River. It was completed in 1867, only two years after the war was over. The same river that separated north and south during the war and was an impediment to those who yearned for freedom in the slave states, was spanned by this beautiful bridge so quickly after the war ended and the bridge still stands as a symbol of unity. It was also the practice bridge for it’s more famous counterpart, the Brooklyn Bridge. We learned more by getting out of the house than we would have staying home, I daresay. Lastly, this is the time of year I start planning ahead. Planning for summer and for next year. For things like camps and weekend trips as well as books, budgets, and goals for the next grade. It is a joy to do, and prevents overwhelm come May and June when there are so many end-of-year items of my to do list. It helps me to enjoy the summer months with less stress, while being a stress reliever in the here and now as well. A win-win if ever there was one. If you are stuck in the mire of February, and not sure how to plan your year better or how to fix some of the issues plaguing your homeschool, we’d love to help you out. We have consulting available, and we’d love to help you sort out what isn’t working so that you can get back to thriving in your role as teacher and mother. Sometimes, it is just the February slump, but other times you just need someone to help you with the task of planning the day, making time for the feast, choosing books appropriate to the students in your home, or some other specific task that you could just use a bit of outside advice on. We have a limited schedule, but we make all the time we can for mothers who ask for help. We are booking March now and would love to be of service to you!